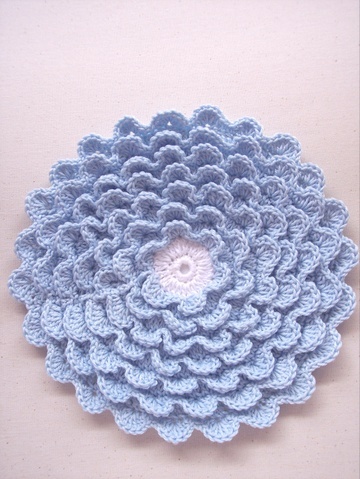 So, do you all remember those pretty crochet hot pads that your grandmother (or mom) used to use when you were a little one? They were so intricate that it seemed that whoever made them must have sat in a rocking chair for ages before completing one round of these things. I did some research and found this chrysanthemum pattern here. *Edit, apparently, the owner of the link decided to take the site down. You can download the pdf pattern here. The pattern was not as detailed as a beginner would need, I had to figure out a few things on my own. I changed the needle size from the recommended 7, to a size D because I was looking for it to have a tighter stitch. I used Paton's "Grace" mercerized cotton fiber, lined it with a single layer of cotton flannel and used Amy Butler fabric for the backing. This was an absolute joy to make! Hope your holiday weekend is everything you hoped for! I've never done any crochet but I can tell it is not the easiest pattern you could find. hi Penny, its fantastic, love it. MUCH better than the hotpads I remember my mom using! Although I think most of hers were knit, not crochet. Love it!! Is that a dk weight cotton? I'm so gonna try that too. Thanks! Where do you come up with this great crocheted stuff? I used to only crochet, but mostly knit now....You've renewed my interest in crocheting. I have a give-away going on this week. that is the cutest thing I have ever seen! I might need to try this one out! that is beautiful! i need to work on my crochet so i can make one! This is freakin' gorgeous! I can't wait to have time to make this beauty. Awesome colors too. That is so beautiful. I'm still trying to figure out how to follow the directions to make a simple little flower and can't seem to get it. You have done a marvelous job! And the idea of sewing it to fabric backing, well, it's a "V 8" moment! Way cute... but I wouldn't let anyone put any food on it!! I'd have to kill them if they got it messy! That is super cute. It would make a great gift. Oh. How. Cute!!!! Love the color and the backing -- just everything. Thanks for posting the link too! So pretty! I really need to learn to crochet! Thank you so much for posting the PDF of this hotpad. It is so beautiful. I also appreciate that the changes you made were written on the pattern. This is so pretty! Old fashion yet looks fresh and modern at the same time! Loving it! How fun, I am one of those way over 30, and my mom and grandma both hat these around the kitchen. Thanks for sharing this pattern, I will make some for myself and my daughters to keep the tradition going. i am in my late 40s and have not seen stuff like this! very nice indeed! I remember these! Very pretty. You have brought this design into this century by using a slightly heavier cotton and I really love the result. I'm going to have to look for some of that cotton and dig out my crochet hooks! Thanks so much for the inspiration. Love this pattern and your choice of cotton fiber! Beautiful work! thanks for sharing!!!!! I have been trying to download instructions for the chrysanthemum hotpad but not having any luck. I get a blank screen when I get to the pdf site. It is really pretty and I would like to start on one as soon as possible. Please help. Could you please post your instructions. The pdf site is not working and I would love to try this pattern. Thank you. I would love to print this pattern, but the Instruction are not posted. 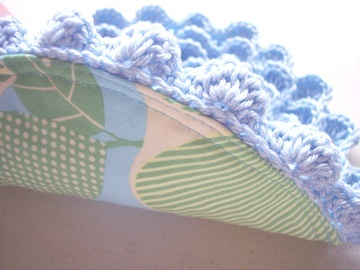 Please post you instructions for this Potholder. It is beautiful. Kay, Yvonne, and Emily, it's working, just click on the second link, not the first. As I explained in the post, the first site I linked to, the owner took down. I then uploaded the pdf and put a new link in. Thank-you. Yes, I realize that. I wanted it to be thicker, and faster :). The print is so small I can't read the instructions...love the look and would like to make some for Christmas gifts. Any suggestions? if you copy and print the pic, you should be able to read it just fine. Thank you ,Penny, for the darling potholder. Cant'wait to start crocheting this awesome hot pad!!!!! Thanks for sharing. A bone ring is a ring made of a hard, heat resistant material. Today, I would have used a drapery ring (which is plastic, but would have been fine). However, I didn't use one in my version. Good luck! I went to the fabric store and ask them for material that is heat resistant. they really do make some, its called insul-bright, you buy it by the yard. sorry, this is for backing and between potholders to keep the heat from coming thru. Sorry. I want to make this but I absolutely can NOT make heads or tails of your handwritten notes. Could you please take the time to re-write them legibly or have someone else write them for you. No offense intended, but please help?!??? The top says"sz-D-Using Paton's Grace mercerized cotton"
At the end of th row...15 sts evenly around, she added "4th round and every round thereafter"
Next she crossed out pieces measures 6 1/4 inches and replaced it with "there are 7 rows of petals"
Hello everyone, Joan interpreted my handwriting perfectly Yay! Thanks so much Joan for taking the time to post that! 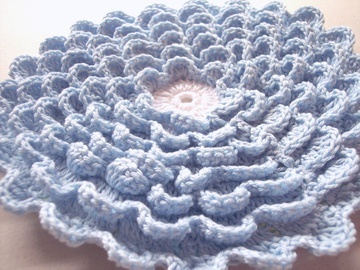 I am a seasoned crochet-er and it took me a couple of attempts to understand the pattern as well. Since the instructions are written out step by step in this post, I would recommend you just try it a couple more times. You'll get it! I do remember my Mom had some of these and can't wait to make my own! Starting at center, ch 6, Join with sl st to form ring. 1st rnd: Ch 1, 15 sc in ring, Join with sl st in 1st sc. 2nd rnd: Ch 3 (to count as 1 dc), dc in same place as sl st, 2 dc in each st around (30 sts), Join with sl st in top st of 1st ch-3. st, half dc in front loop of next st, sc in front loop of next 2 sts, Repeat from* around, Join last sc in same place as 1st sc. 4th rnd: Ch 3, dc in remaining loop of each st of rnd before last, increasing 15 sts evenly around from 4th rnd and every rnd thereafter. (45 sts), Join. Repeat 3rd and 4th rnds alternately until there are seven rows of petals and piece measures approx. 6 ¼”, ending with the 3rd rnd, break off. having petals on outside, Sew on bone ring. allowing 1½” inch all around for seams, turn back seam allowance and sew neatly in place on wrong side. can we make the writing pattern bigger and make the corrections? ?